I went on a four mile trek this morning, to get some exercise, fresh air and hunt for weeds. I was rewarded when I spied some interesting looking weeds down beside a creek. In order to clear the view and get a better look at my intended subjects, I brushed aside some tall delicate foxtails. After I captured a few shots, I climbed back up to the road and ramped up my pace, swinging my arms in front of me, happy to be out and about. Something on my hand caught my eye, and this is what I saw! 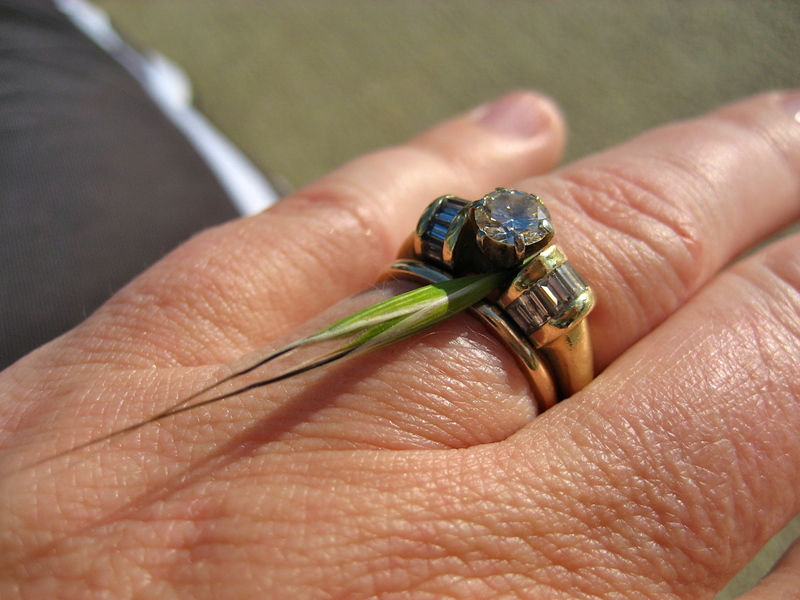 This opportunistic foxtail took advantage of my interest in a competing weed to smoothly wedge itself into my wedding ring! I laughed and laughed when I saw this! How obsessed I must be to my hobby, that it looks one wants to marry me? Recognizing such strong intentions, and the ingenuity of execution, I promptly stopped my walk and commenced taking photos of my hand, which is not the easiest thing to do. I plopped down on the sidewalk for this shot and ignored the looks of passersby on bicycle, horse and car while I held my arm out this way and that, trying to catch the light and frame the weed with an interesting background. I continued my walk and the foxtail stuck with me the entire time, for three additional miles. I giggled every time I looked at my wedding ring “enhancement”. This engaging foxtail forced itself upon me to become the subject for today, and all I could do was comply. So it’s true. All the good ones are already taken! Thank you Kwesti. It’s always fun to see you’ve stopped by. I don’t know about ALL the good ones, I do know that I have found my soul mate and am eternally grateful. A bit of embarrassment from passerby’s is nothing compared to the nice shot you got. The foxtail made a good choice when it decided to hitchhike on your ring. Thank you Kristopher. I agree with you about the embarrassment. I like the shot, I loved giggling about it, and perhaps I gave the passersby a mystery to think about for the day…(What was she doing?”).